Are players wrong to feel entitled? Gordon had a post up yesterday that asked whether modern day MMO players were lazy or if it just seemed that way since games are more accessible these days. I felt compelled to respond, which I did in the comments section, but I think that the topic of my response bears a little more hashing out. In my opinion, MMO players aren’t so much lazy as they are entitled. Entitlement, really, has its core in accessibility. After all, if some new game didn’t come along and set a precedent for, let’s say, grouping, there wouldn’t be anything to compare to and nothing to feel entitled about. Comparing it to laziness, then, is the same as comparing “would players do something if it wasn’t easy” to “players want something to be easy but will make due if they have to.” That’s a pretty important distinction and where my thoughts stray from the topic Gordon brought up (and thank you for that interesting nugget of contemplation!). As I mulled this over, I came to a central question of “do the noobs have it right?” No offense there, because what I’m referring to the newcoming generation of WoW players just now cutting their teeth on the wider array of MMOs available. In truth, there are more of these players than those of us who got started pre-WoW with MUDs and EQ. When these players come to a game like Fallen Earth, they’re shocked by the rusticness of it. , last time I played, one player, couldn’t help lamenting the fact he couldn’t respec his character in region chat. Whether he was right or wrong to expect such a thing (and any FE fan will tell you he was wrong), it’s a prime example of how World of Warcraft has set a bar in player’s minds. So, to return to my original question, is it wrong for players to feel entitled to these eases of play? If we cut the MMO-sphere down the middle into “mainstream” and “indie” I would say no, it’s not wrong. Unless you’re playing a fledgling game, like Darkfall, any AAA MMO coming into the scene should have a basic understanding of what players are used to and what they would be wise to deliver. Take Aion, for example. Fun game, but horrible grinding. Players coming from WoW aren’t used to that and, more importantly, don’t find it fun. The result? Look! We sold a million boxes last month. Subscribers? Well… we don’t want to comment on that. Anyone with the notion to check out the various blogs and forums will tell you that the grind is one of the biggest reasons people are becoming frustrated with the game. Scratch that. Their next patch tells you that, since its main focus is reducing the grind. Anyways, where was I? 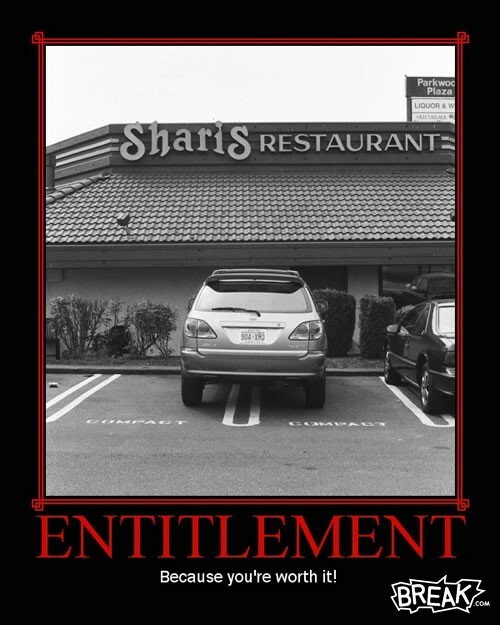 Right, entitlements. Look at WAR: crap PvE. Funnily enough, PvE fans coming in from WoW noticed this immediately and left the game in mass. If that didn’t do them in, waiting hours for a scenario pop probably did. The list goes on. What do you mean... RESTED xp? importantly, those big numbers are what investors care about. This generation, tourists or not, is important and will drive the industry whether the grizzled vets like it or not. These are the players the biggest and most feature flush MMOs get made for, whereas niche games, not delivering on the new wave of entitlements, cater to the older, content-specific, crowd. I’ve come to look at it like this. My great, great, grandfather would probably be annoyed with the fact that I expect running water and proper plumbing in my house. Does that mean I’d go without it or not expect it in a new house? No. In that same way, the “WoW generation” of MMO players are the wave whose expectations will guide development. In short, don’t expect the next AAA MMO to cater to the older crowd over the newer. My great grandpappy might have wanted a hand pump out back but it doesn’t mean the water authority will give it to him. The majority wants what the majority wants and, for better or worse, they’re the target audience. In a way, entitlements drive the industry forward. They say, here’s what we expect and encourage developers to provide it better than the last. Granted, I’d agree that it might discourage initial innovation, but once the bells and whistles are in, you have a game better suited subscriber-wise to take risks and make a real dent in the industry. No offense to games like Darkfall and EVE, but they’re not pushing the industry anywhere right now, maybe showing that niche games are a little too forgettable to most MMO players. WoW, LotRO, and EQ2 on the other hand, are far better suited to take that challenge on. That’s my two cents heading into the weekend. Have a good one everybody! PS: For the record, I’m a niche fan, but I seriously doubt big game companies will take low-subscriber games as any basis for what they should do in their own. Most players won’t know or care what a game like Darkfall does because it doesn’t have X million subscribers. Is it right or fair? Probably not and it’s too the wider industry’s detriment. Yet, I don’t see it changing unless one of these indie games becomes a mass success. PPS: Gordon’s original post was specific to grouping, just to be clear. Very good post. But I digress 🙁 I honestly think its the Tourist and Nomad Gamer mentalities that the Triple A game developing studios are hoping to bait are the sole reason innovation, and creativity in the games we play are shelved, or get shelved in the life span of the games. Was Blizzards implementation of their respec and dual spec systems innovative? I say sure it was. It made my life easier going from PVP to PVE spec, hell to even PVE heal spec to an encounter specific (resto druid p3 heroic anub 25) PVE heal spec both usable in one night. But I think the innovation has lost its flavor and spice along the way, Since the majority of the studios now a days are creating toolsets to entice and keep the Tourist and Nomad playerbase, they seem to be innovative only along the lines of retention and enticement, rather than putting that innovation towards a gameplay that always makes up “+12 to speed uphill both ways Cane” users were used to when this industry was in its infancy. In fact, it was this very mindset and play style that made me to finally step away from and cancel my 3 year old WoW account. I have a question. I heard you on the MMO voices podcast the other day, and you mentioned buying windows seven from digital river for students. I was wondering what the web address was. I searched digital river and could find nothing advertising the sale of windows seven. I enjoyed your conversation with the other three hosts, and thought I would check out your blog. You can buy Windows 7 from the Windows site if you want. The upgrade goes for 30 bucks if you have a .edu e-mail address. You just have to go look for it on the site. 78 comments, but an amazing diversity of view points. I bought my copy here. You’ll have to provide your .edu address and they’ll send you a purchase link via email. It looks like several affiliate sites are offering the same promotion but I can vouche for Digital River being speedy and reliable. Just to pick up on something you said: “No offense to games like Darkfall and EVE, but they’re not pushing the industry anywhere right now”. Although I haven’t played Darkfall, I would disagree with this about EVE. I think CCP is actually pushing the boundaries of MMORPGs and the industry, just in a different direction from most of the other games. WRT “No offense to games like Darkfall and EVE, but they’re not pushing the industry anywhere right now”: I think that what was meant there is that those games are not encouraging copycats among other game makers. EVE is obviously a very solid game which keeps its subscribers by being a different kind of MMO, but nobody is trying to emulate it because although it’s an enduring success, it’s just not very big. That makes it too much of a risk to attempt. This is the sort of attitude that tends to put companies out of business. Don’t forget that, at the end of the day, an MMO is a business. Entitlement is part and parcel of the whole business model. If a company dictates to a customer how it’s going to be, that company won’t be around for very long. Of course players are going to feel entitled, and it isn’t wrong. At the end of the day, they’re the ones shelling out the money to play. Games that actively try and punish players for not fitting the mold they’ve decided to go with, such as savage PvP worlds like EvE or forced grouping like EverQuest will have an incredibly difficult time making it big. People rarely get together and form companies just to give out labor without compensation, so holding onto the idea that players are somehow acting badly for being “entitled” is a bit ludicrous. An MMO developer, like any business for that matter, gets rich by making as many people happy as possible for a price that’s reasonable. This means they have to cater to that entitlement, the developer is trying to part the customer with the fruits of his labor, after all, and the best way to do that is offer a product he wants to pay for. If that means offering a game that solo play is just as viable as group play, then the market has spoken and no degree of insult slinging will ever change that. Where to find the cheapest WoW items? Raiditem is your first choice! When raiditem.com you want to have an abundance of WoW gold, just choose us! Fast Delivery, Safe and Guaranteed! Sell Wow Gold for Time Cards. We got what you want, for your server,raiditem.com, ready for a cheap and fast delivery!